Mid week, it’s cold and dark outside, best to just hunker down and stare blankly at the idiot box until it’s time to crawl into bed and hope that sleep can bring brief escape from the dead eyed misery of modern life. But wait! 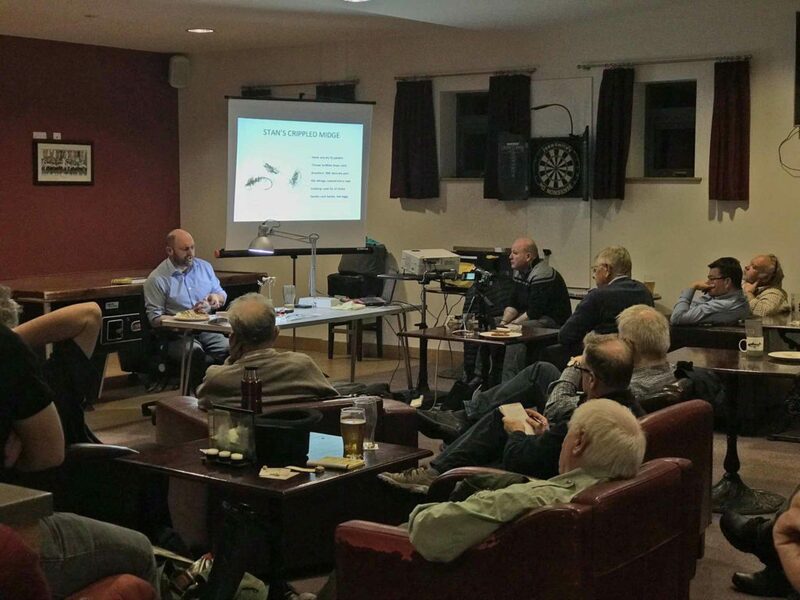 Stu texted me earlier this week to give me a heads up that Matt Eastham was giving a talk to the Fly Dressers Guild in Leeds, did I fancy going? I most certainly did. NCA’s blog has been around even longer than ours and it’s one of the best out there. The opportunity to meet Matt and see what goes on at the Fly Dressers Guild was too good to miss! The ‘FDG’ seem a pretty organised bunch, what with the projector, live filming, raffle and buffet complete with profiteroles. It was a good turn out as well, plenty of people obviously share an interest in Matt’s work. It was very interesting to watch someone else tie up close and personal (via the screen) and learn new ways of doing things and also see that, ah, I’m not the only one who does that when tying etc. Matt went through a series of flies which all looked very useful indeed (once I’d got over the shock of the presence of rubber legs on some of them 🙂 ) . Indeed, I was inspired to get the fly tying materials out later in the week and tie a grayling fly inspired by one of the patterns he showed us. I couldn’t tie the actual fly (a Duracell) because I don’t have any jig hooks which are now all the rage, along with rubber legs! This, and seeing Stu in action yesterday with his French nymphing outfit (could that sound any seedier) has made me realise that my trout/grayling fishing knowledge is about 10 years behind the times.